Contains affiliate links - I may earn a commission on any qualified purchases made through the links provided at no additional cost to you. Step one: Become a Prime Member. It would take forever and a day to explain all the benefits but the most obvious perk is of course the 2-Day Shipping. I have gotten so used to ordering things off Amazon.com that when I have to wait more than two days for an item from another site, I become someone named Carol wanting to speak to someone's manager. First world problems ya'll. 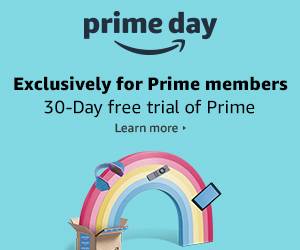 So if you're not already a Prime member. Join!!! Step two: SHOP!!!!! Prime Day is here through tomorrow so hurry for the best deals. Here are some products that I love (I won't link something I don't 100% stand behind). - Amazon Fire Stick - When my husband and I travel, we take a Fire Stick with us and it's great! You get all the Amazon Prime Video as well as other TV apps that you stream at home, but on the go as well! - trèStiQue Makeup - You guys! I'm obsessed with this makeup. Each product, comes with it's own tool, magnetic closure, and super blend-able formulas. I love their Essential 8 kit (for all the products) or just buy them individually. They are AMAZING! - RING Doorbell - I have teenager. We like to see who's coming to our front door, we also have a mail theft problem in our neighborhood. So we have a Ring Doorbell and cameras set up around the house. We like it, we love the features and peace of mind it give us. You should consider it as it works seamlessly with your smartphone, Amazon Echo Spot, and online. - Audible.Com - If you have a long commute, like to take roadtrips, etc. You should be subscribing to Audible. The audiobooks on long drives are great. We love Neil Gaiman books! What are some of your favorite Amazon products? Comment below!